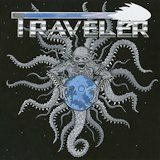 From Canada comes a year-old band with an outsized retro heavy metal sound, Traveler. Its self-titled debut has a lot in common with one I reviewed a few weeks ago, Greyhawk; both new bands are enthusiastic proponents of heaviness, speed, and reverb, with a lot of retro stylings in the guitar sound but modern influences in the songwriting and lyrical materials. Former Borrowed Time (and current Gatekeeper) singer Jean-Pierre Abboud's muscular vocals don't hurt this great little album a bit, either. I expected a cover of the Judas Priest song for the first track, Starbreaker, but it's actually an original composition (although containing plenty of nods to its namesake), a speed-metal race more on the lines of the Painkiller album than 70s-era Priest. We've heard the echoing vocals, guitar solo windups, and NWOBHM riffs power chords of Street Machine before, but the band does it snappily and with vitality. Another favorite of mine is the metal cover of the "Konamized" chiptune from the indie game 8-Bit Killer, in which metal meets meta: A band influenced by old metal genres covering the work of a game influenced by old video game genres. All of Traveler's compositions are solid, though some are more rousing than others. The band seems to do best on fast gallops and flat-out runs, and they seem to prefer that style of song in the first place, but even on the slower Fallen Heroes, they're solid. Their debut is a pleasant surprise that left me eager to see how Traveler develops from here.